I know the weather may seem a little too warm to wear such a fluffy jumper but I couldn't resist. And the air-con's turning work into an Arctic so I think that's an excuse to keep up the cosy jumpers in Spring.. right?! Or maybe I'm kidding myself and just sweating one out all for the sake of fashion. Either way I think my outfit summed up a very tom-boyish look today! But we girls don't mind scraping our knee's and a little dirt too! Therefore ripped jeans were on the cards yet again and I thought what better to pair with them than a fluffy navy jumper from Topshop. The jumper is a little slouchy to create a very comfy laid back appeal as well as being super warm. 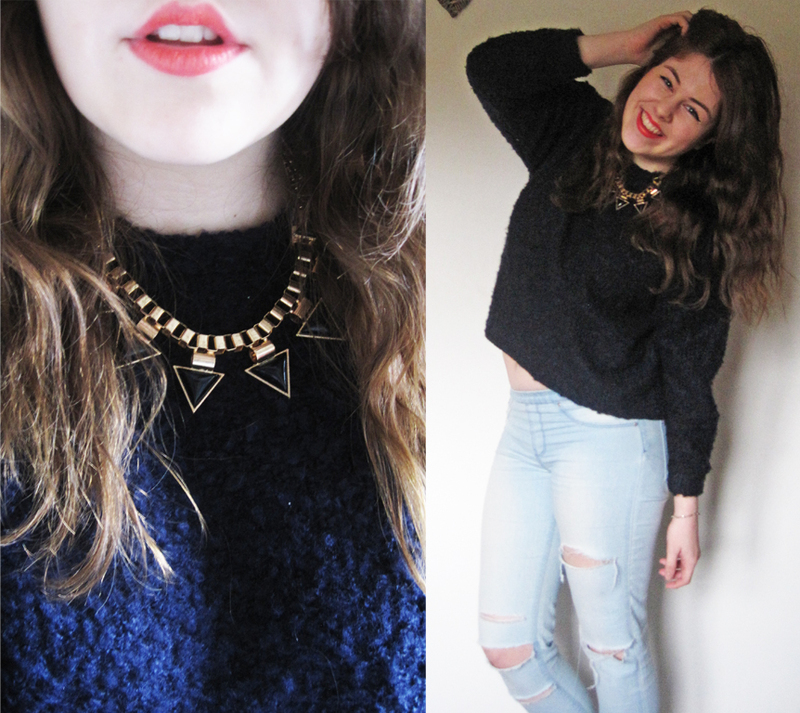 I've then added a gold and black necklace, which is also the same necklace I wore in my previous post! I think this necklace keeps the glamor appeal whilst adding a little edge. Of course I couldn't resist a little extra dash of colour so I've gone for a coral colour from the Stay Pout Seventeen collection. It's called 'Make An Entrance' and I've dabbed a little on rather than apply a coat so that it became a coral colour rather than fall into the red shade.